Unlike other auto-injectors, ARAI stores drugs in a glass-free primary container to avoid complications posed by traditional glass syringes. The flexible container can be configured to carry a single drug solution or individually store multiple drug constituents that are either injected separately or automatically mixed just prior to injection. ARAI is powered by a pressure-activated release propelled by a mini CO2 cartridge. 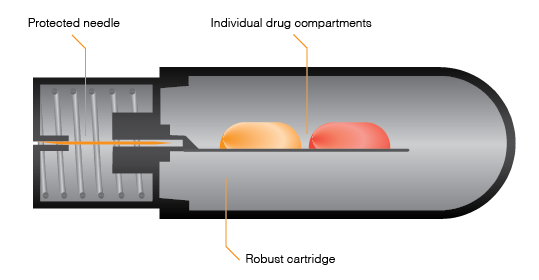 With its flexible drug container and automatic injection cycle, ARAI eliminates the mechanical constraints of spring-activated auto-injectors. A prefilled auto-injector, ARAI is designed for single-hand, single-step activation. The automatic injection cycle is marked by tactile, audible, and visual feedback to minimize the opportunity for user error. Designed for the toughest military combat conditions, ARAI stores drugs in a glass-free primary container. Its durable housing protects compounds in wet, wet-wet and wet-dry combinations in up to 5ml doses.